As with several other works in my collection, my discovery of this work was complete serendipity. I was websurfing late one night in February 2003, when I realized that I had not visited Foster/White Gallery's web site in a while. As soon as I clicked to visit the site, the first thing I saw was this work. I was immediately intrigued. 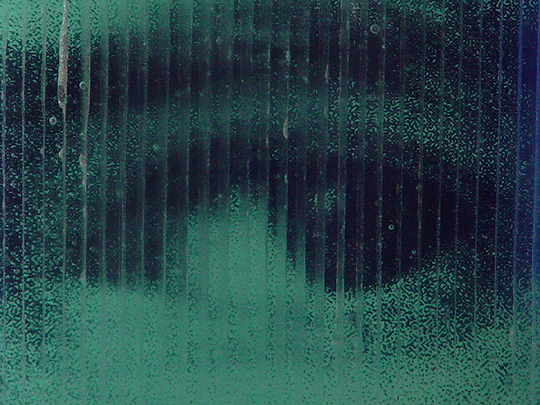 Once he "photo-engraved" part of a photograph onto a sheet of green glass (the green tint in the glass comes from iron mixed into the glass to strengthen it), Mark then started adding additional glass elements. Behind the first sheet, Mark added a sheet of blue glass. 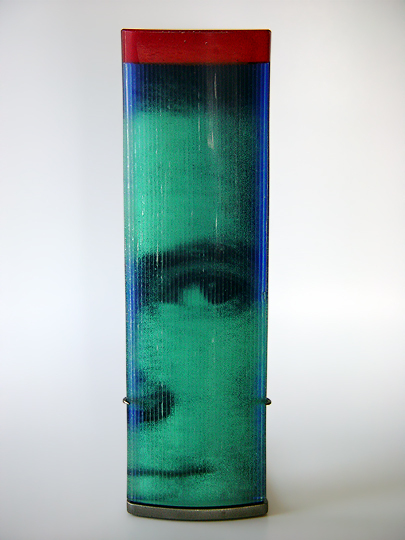 In front, he added a sheet of green glass that's actually composed of 35 or so strips of fused glass... this sheet acts somewhat like a diffraction grating, in that the strips tend to direct light. To the top of the work, Mark added some red and green sheets as sort of a cap. He then fused all of this glass into a single mass, and then polished it to a smooth surface. The metal stand holds the work upright and prevents it from falling over... it can't stand by itself. The resulting work is, I think, really unique. The idea of a photograph in glass is something I never would have conceived, and the image that you see here has a very classic look to it... as I said above, it reminds me very much of the faces on American currency. I really like the effect created by the front layer of glass strips... it causes the image to change ever-so-slightly as you move around the work. I also like that this work represents the advent of a new technique for working with glass. Scroll down to see a detail shot of this work.